Erdene Resource Development Corp. (TSX:ERD) ("Erdene" or "Company") is pleased to announce receipt of the initial mineral resource estimate ("Mineral Resource") for Discovery Zone and Union North, two of 18 target areas identified to date at the Company's 100%-owned Altan Nar Gold-Polymetallic Project ("Altan Nar" or the "Project") in southwest Mongolia. The Mineral Resource is contained in a report produced by RungePincockMinarco Limited ("RPM") in accordance with National Instrument 43-101 ("NI 43-101") guidelines (the "Resource Report"). The Resource Report is available on SEDAR (click here for link). "We are very pleased to have reached this major milestone for the Altan Nar Project," said Peter Akerley, President and CEO of Erdene. "Delivering this initial resource on time, under budget and having it exceed our targeted size and grade, is a reflection of the quality of the project and the dedication of the discovery team involved. Although we feel we are just getting started, the reported, near-surface resource will allow us to begin to explore more fully our mining and processing options within an expedited development plan while continuing to expand the resource throughout the large 5.6 km Altan Nar target area. 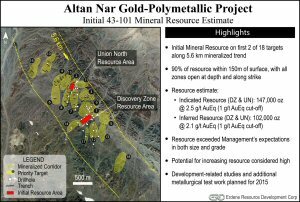 Based on our recent drilling success and this maiden resource, our excitement and confidence about the ultimate size potential of Altan Nar continues to build." The Resource Report is based on information provided to RPM by Erdene and verified where possible by RPM. All statistical analysis and mineral resource estimations were carried out by RPM. RPM developed three dimensional digital resources for the concentration of the gold, silver, zinc and lead metals and developed the resource estimates based on the statistical analysis of the data provided. Table 1 below shows the Indicated and Inferred Mineral Resource estimate for the Discovery Zone and Union North prospects as at February 19, 2015. The Mineral Resource was completed by RPM in accordance with the recommended guidelines of the CIM Definition Standards referenced in NI 43-101. The Mineral Resources are provided at a number of AuEq cut-offs, however RPM suggests reporting the Mineral Resource at a 1.0 g/t AuEq cut-off. The 0.6 g/t AuEq and 1.4 g/t AuEq cut-off grade Mineral Resources are provided for illustrative purposes. 1. The Mineral Resource Estimate Summary has been compiled under the supervision of Mr. Jeremy Clark who is a full-time employee of RPM and a Member of the Australian Institute of Geoscientists. Mr. Clark has sufficient experience that is relevant to the style of mineralisation and type of deposit under consideration and to the activity that he has undertaken to qualify as a Qualified Person as defined in the CIM Standards of Disclosure. 2. All Mineral Resource figures reported in the table above represent estimates as at 19th February, 2015. Mineral Resource estimates are not precise calculations, being dependent on the interpretation of limited information on the location, shape and continuity of the occurrence and on the available sampling results. The totals contained in the above table have been rounded to reflect the relative uncertainty of the estimate. Rounding may cause some computational discrepancies. 3. Mineral Resource grades are reported in accordance with the CIM Standards. 4. Mineral Resources reported on a dry in-situ basis. 5. Totals may differ due to rounding. The Mineral Resource was completed by RPM using ordinary kriging and inverse distance squared interpolation methods. The Mineral Resource is reported using a cut-off grade which is deemed appropriate for the style of mineralization and the current state of the Mineral Resources. Of importance for mine planning, the model accommodates in-situ and contact dilution but excludes mining dilution. Block size (25 x 5 x 5 m, sub-blocked to 3.25 x 1.25 x 1.25 m) is similar to the expected small-mining units conventionally used in this type of deposit, and appropriate for an open pit mine. Included for reference with this press release is a plan map of the Altan Nar mineralized trend showing the location of the initial Mineral Resource and additional 16 target areas. With the initial resource established, Erdene will look towards the completion of a preliminary scoping study in 2015 which will consider options for expedited development including evaluating the concept of producing a potentially high value gold, silver, lead and zinc concentrate(s) to be sold into China (rail link 175 km to the south of Altan Nar) for final processing. As stated by RPM in the Resource Report, this option has the potential to enable relatively low capital and operating costs during start up and for the generation of early cash flow. Simultaneously, in the first half of 2015, Erdene intends to complete additional evaluation of the remaining target areas to assist in determining the high priority areas for defining additional near-surface resources at Altan Nar. The potential for increasing the resource is considered by RPM to be good, with the Discovery Zone and Union North open along strike and at depth, and multiple priority targets throughout the remaining 16 prospects. The Altan Nar deposit has been drilled using diamond drilling methods, on nominal 100 m section line spacing along strike with some local areas drilled on 50 m sections and infilled with a single hole on several 25 m spaced section lines. Drilling on each section is on average at 30 m spacing with holes orientated either east or west. Trench sampling has been conducted across the main mineralized lodes (i.e. domains) to verify outcropping of the lodes. RPM concluded that Erdene conducted a suitable program of quality assurance and quality control ("QA/QC") and has used certified laboratories for analysis of samples. The Mineral Resource was classified on the basis of sample quality, sample spacing, and continuity of the interpreted lodes as modelled during the geostatistical analysis. The mineral resource classification was applied to each of the gold and zinc lodes independently due to the more robust continuity of the broad base metal mineralization in comparison to the narrow gold mineralization. The Indicated Mineral Resource was defined within the main lodes where sample spacing was at a maximum of 35 m and the lodes were intersected by at least two drill holes along strike, and one drill hole down dip. The determined sample spacing was a reflection of the variogram ranges modelled during the geospatial analysis. RPM have considered the costs, recoveries and dilutions expected by comparing the Altan Nar Project with other similar deposits in the region and adjusted these by considering the location of the Project and the deposit characteristics. RPM has concluded that the mineralization is potentially economically extractable via typical open cut mining methods, with a the life-of-mine ("LOM") mining cut-off grade estimated to be approximately 1.0 g/t AuEq which is based on a high level evaluation of expected mining/process and cost parameters. At this time, RPM considers a cut-off grade, which is appropriate for the Mineral Resources for the Project that could be economically extractable sometime in the future, to be 1.0 g/t AuEq. 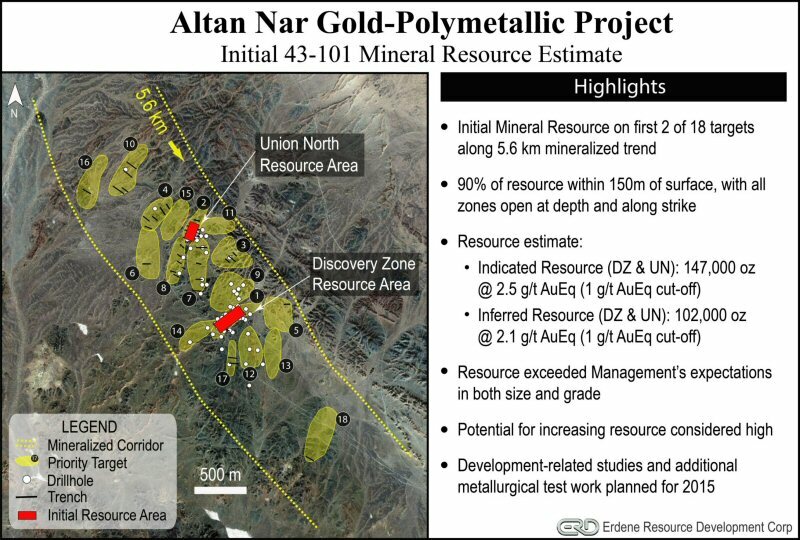 Although a 1.0 g/t AuEq cut-off grade is considered by Erdene management to be conservative for many gold deposits, based on the early stage and location of Altan Nar, a higher cut-off is being applied; however, it should be noted that in the future, as processing recoveries and costs are finalized with increasing volumes of ore and a mature mining operation, the lower grades may become economic. In regards to this possibility, there exists a sharp increase in the tonnage and ounces at cut-off grades from 0.6 g/t AuEq to 0.2 g/t AuEq, with a 50% increase in the resources while still maintaining greater than 1.0 g/t AuEq average grade. To assist in reporting the Mineral Resources in a transparent manner, Erdene requested that RPM report a AuEq value in an effort to express the combined value of gold, silver, lead and zinc as a percentage of gold, and is provided for illustrative purposes only. No allowances have been made for recovery losses that may occur should mining eventually result. Calculations assume metal prices of US $1,200/oz gold, US $18/oz silver, and US $0.90/lb for lead and zinc. RPM accepts that the sampling and assaying methods and approach were reasonable for this style of mineralization. RPM reported that the samples are representative and there appears to be no discernible sample biases introduced during sampling. RPM carried out a QA/QC testing program consisting of 14 types of commercial standards, laboratory internal standards as well as internal repeats. In addition, RPM arranged for 53 independent coarse reject samples from all phases of drilling programs to be re-submitted for check analysis to ALS Lab in Ulaanbaatar, Mongolia. RPM concluded that overall the QA/QC data does not indicate any bias and supports the assay data used in the Mineral Resource estimate. RPM used a 0.3 g/t gold cut-off to delineate the gold mineralized lodes at Altan Nar, based on statistical analysis of all samples at the Project. A minimum width of 2 m was applied. In addition, zinc/lead mineralized lodes were interpreted using a 1,200 ppm zinc cut-off, again based on statistical analysis, in conjunction with observed down-hole logging of alteration zones. The top-cut analysis completed by RPM included evaluation of histograms, log probability plots and descriptive statistics for the data distributions within each interpreted gold and base metal lode. An analysis of correlation coefficients and observed breaks in the log probability plots was used to determine appropriate top-cuts. Visual analysis of the drill holes was used to determine if the high grades were isolated or part of continuous zones of high grades. Although the deposit is unlikely to have any nugget affect, due to its sub-micron gold character, a conservative approach was utilized with gold caps applied individually to the most significant gold domains with concentrations in the range of 5 to 22 g/t. The parent block size was determined based on the drill spacing and geological variability of the deposit. The Discovery Zone and Union North prospects have been drilled at spacing varying from 50 to 100 m along strike, and at 30 to 50 m on section. Drilling has been conducted along oblique lines to intersect the mineralized lodes as close to perpendicular as possible. In order to best represent the narrow gold lodes which have variable dips with depth, and variable strike orientation at the local scale, RPM has used a parent block size of 25 m (Y), 5 m (X), and 5 m (Z), with sub-cells to 3.125 m by 1.25 m by 1.25 m.
The Resource Report was prepared by Jeremy Clark, RPM Hong Kong (Mineral Resource and overall report author), Dr Andrew Newell, RPM Brisbane (Metallurgy) and Stewart Coates, RPM Ulaanbaatar, (Site Visit, Sample Prep and Analysis). Messrs. Clark, Newell and Coates are each a Qualified Person within the meaning of such term under NI 43-101; Mr. Clark is a Member of the Australian Institute of Geoscientists (MAIG) Membership No 3567; Mr. Newell is Chartered Professional with the Australasian Institute of Mining and Metallurgy (CP(Met)) and a Chartered Professional of the Institute of Engineers, Australasia (CP(Eng)); and Mr. Coates is a registered member of the Association of Professional Engineers and Geoscientists of the Province of British Columbia (APEGBC), Registration No. 36146. Messrs. Clark, Newell and Coates consent to the inclusion in this release of the matters disclosed based on the information in the Resource Report in the form and context in which it appears. Altan Nar is predominantly an intermediate sulfidation, carbonate base metal gold system, a style of deposit which has close magmatic relationships, often being base metal rich and locally associated with porphyry deposits. This style of gold mineralization represents the most prolific style of gold mineralization in the southeast Asia region and includes Rio Tinto Plc's formerly producing Kelian mine (Indonesia), Barrick Gold Corp.'s Porgera mine (Papua New Guinea), and elsewhere in the world, Lundin Gold Inc.'s Fruta del Norte project (Ecuador), AngloGold Ashanti Ltd.'s Cripple Creek and Victor gold mine (Colorado), Gabriel Resources Ltd.'s Rosia Montana project (Romania), and in Mexico five of the world's top silver producers including Goldcorp Inc.'s Penasquito mine. This type of deposit is often associated with breccia pipes (diatremes) and can extend vertically for greater than 1 kilometre. The Kelian open pit, for example, was 500 m deep. The Altan Nar prospect is contained within the Tsenkher Nomin exploration license in southwest Mongolia, approximately 175 km northwest of the Ceke rail crossing on the Mongolia-China border. The exploration license was first acquired by Erdene in December of 2009 and is currently in its sixth year of a 12 year term, after which it can convert to a mining licence. Exploration work undertaken within the Tsenkher Nomin license by the Company during the past four years has established Altan Nar as a significant new epithermal intermediate-sulphidation gold-silver-lead-zinc mineralized system. Exploration, specifically the 2013 trenching program and 2014 surface mapping, geochemical and geophysical surveys, trenching and drilling, has greatly expanded the areas of known mineralization with 20 target areas now documented over a 6 x 10 km area with the main structural trend and primary location of gold mineralization being approximately 5.6 x 1.5 km, consisting of 18 target areas. In Q4 2014 the Company completed 1,676 m of resource delineation drilling which has culminated in the reporting of this Mineral Resource estimate. Since acquisition, Erdene has drilled 71 surface holes (total of 10,819 m) and excavated 39 trenches (total of 2,927 m) from 2011 to 2014. Erdene Resource Development Corp. is a Canada-based resource company focused on the acquisition, exploration, and development of precious and base metals in underexplored and highly prospective Mongolia. For further information on the Company, please visit www.erdene.com. Erdene has 82,636,233 issued and outstanding common shares and, a fully diluted position of 93,317,283 common shares.